This week, Erik Berner posts the first in his series of studies of the books in the Secular Legislation section of the c.1878 St. Ignatius College Library catalog. Here he explores two works that long predate the late nineteenth-century school. Title page of the first volume of the 1624 edition still in the collections of Loyola’s libraries. The ancient Corpus Juris Civilis or “Body of Civil Law” of Justinian (483-565) is a fine starting point for a collection of legal works at a Jesuit college. Two editions of Justinian’s Civil Law are listed in the c.1878 St. Ignatius College library catalog: one from 1624 and another from 1721. Both still exist and are held in University Special Collections in Cudahy Library. The 1624 edition, printed in Geneva, is a reprinting of a 1583 edition recognized by scholars as one of the most influential. The 1583 edition was first printed by the French jurist and law professor at University of Geneva, Dionysus Godefroy, after the text’s rediscovery. Like most Latin learning, Justinian’s Code had been to lost to European thinkers since it’s 6th century compilation, but was reintroduced through translations during the Renaissance Period (despite Europe’s concurrent Dark Age, the period from the fall of the Roman Empire and the rise of European Empires is considered a Golden Age of Islamic culture and learning, during which Muslim scholars studied and circulated Ancient Western texts and ideas, translated into Arabic). 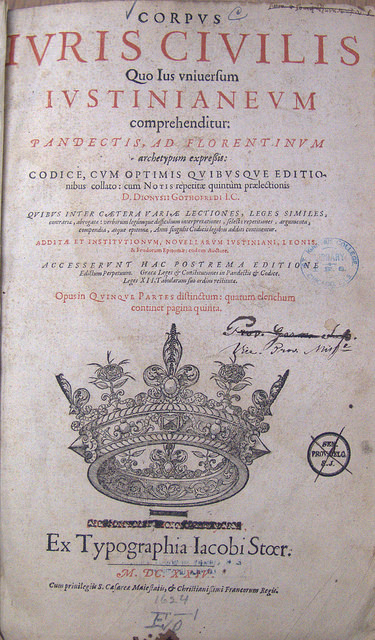 Initially taught at the University in Bologna and circulated among Italian merchants, Godefroy’s Geneva edition is recognized as the first proper Western European edition, and was, in fact, the first to print these laws under the title Corpus Juris Civilis. Reading the Preface, written by Godefroy himself (or at least claiming to be), was a true challenge of my very intermediate French skills from high school, but I was able to glean the scholarly intent of the edition. It was intended “pour cours de droit civil” (for classes in civil law), presumably, and not surprisingly, at the University in Geneva where Godefroy taught. The title page left me with a few questions about publication and previous ownership, claiming to be “ex typographia Iacobi Stoer”. Searches on Google, World Cat, and Open Library turn up publications under Stoer’s name, all from the 17th century, such as a French dictionary and a “General Inventory of the History of France”, but no peripheral information. Jesuits in at least two different provinces – one in Europe, the other in North America – have owned the 1624 Corpus. 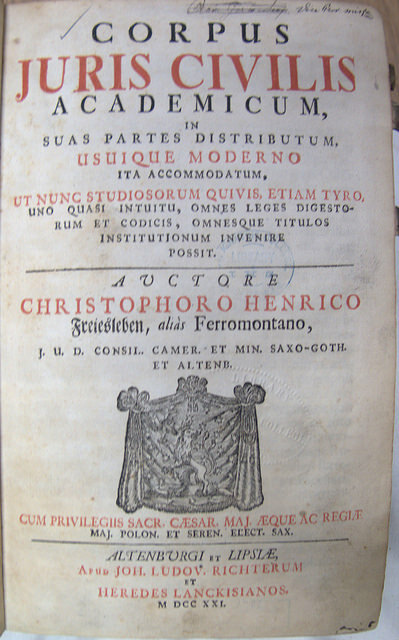 Title page of the 1721 Corpus also in the collections of Loyola’s libraries today. The second copy was printed in 1721 in Altenburg, a town in Saxony (now Germany) by “Joh. Ludov. Richterum et Heredes Lanckisianos” (about whom, the only links a google search turned up were about this very edition of the Corpus Juris Civilis). They were not the original printers of this edition. Instead, they were reprinting one that originated a year earlier in Liepzig. This edition is specifically intended for scholarly use; it’s full title is Corpus Juris Civilis Academicum: in suas partes distributum, usuique moderno ita accommodatum, ut nunc studiosorum quivis, etiam tyro, uno quasi intuitu, omnes leges digestorum et codicis, omnesque titulos institutionum invenire possit. From the Latin, this roughly means that it is adapted for modern usage so that all students may learn from it. This would have been used in an inns of court type legal education. The “inns of court” refers to the practice, prevalent before the development of formal law schools, of prospective barristers sitting in on actual court proceedings to learn in an unstructured manner about the law. It is annotated for these purposes, though the Latin and Old French are hard to understand for me. In this particular copy is the handwritten name “Christophorro Henrico,” a google search of which turns up nothing. It is likely the name of a previous owner. On a scale from poor to expert, my Latin skills could be labeled…nonexistent. Therefore my only knowledge of the contents of these books comes from internet research; the Corpus Juris Civilis was Justinian’s attempt to compile all the previous law he found useful, by previous emperors and himself, and any further laws that he wished to enact, covering in minutiae every detail of Roman life, into one place and make it the one and only law book that anybody in the Empire would ever need to reference for anything; in fact, referral to any other was forbidden by imperial decree. It is obvious why this set of laws, then, would have such a lasting impact, perhaps being the most influential set of laws until the Napoleonic Code, a body of laws also found on the library’s shelves which I will discuss in a few weeks. Some great marginalia in Loyola’s copy of the 1721 Corpus. New this semester: What law books are on the original library shelves? Welcome back to the Spring 2017 semester! Recent graduate Erik Berner will be sharing the outcome of his investigation of the titles in the Secular Legislation section of the Legislation division of the original library catalog over the coming weeks. His introductory post follows. Check back regularly in the coming weeks for posts on the specific titles in this division. Listing of the Legislation Division from the index of the original St. Ignatius College library catalog. Last spring I explored whether the Jesuits at St. Ignatius College (precursor to Loyola University Chicago) might have been trying to found a law school at the end of the nineteenth century. Nearly forty years elapsed between the founding of the St Ignatius College and the founding of its law school. The college’s original library catalog provided potential evidence of whether the Jesuits intended to educate students for the law earlier, as I explored in my posts here and here. In the end, I concluded it was unlikely that the Jesuit founders of St. Ignatius gathered the books in the secular law section of their library with the express intent of founding a law school. Nevertheless, they managed to assemble an impressive collection, whether by seeking out books with a specific intent or taking what was available to them. The Harvard method of institutionalized, formal, legal education at the university level had only just been begun by Joseph Story the year this catalog was compiled. Up to this point, most legal education was undertaken through apprenticeships with established lawyers. The St. Ignatius collection contained many of the essential texts for a legal education at the time, but its lack of certain seminal texts, such as Blackstone’s Commentaries, led me to conclude the collection was for the reference of the Jesuits more than for a comprehensive legal education of their students. In the original c.1878 catalog, the Legislation Division contained 68 titles: 30 in Secular Legislation and 38 in Ecclesiastical Legislation. I focused on the Secular Legislation collection. The books can be divided into seven distinct segments: Ancient Law, British Law, Continental European Law, US Law (subdivided into Colonial and Post-Colonial), General Laws and Statutes (text of the law), Personal Reference/Commentary (texts about the law, intended for general readership), and Academic (texts about the law, expressly intended for scholarly/academic use). Though some of these books have disappeared, many are still in circulation, or held in the Special Collections, of Loyola university libraries today. I have created an annotated bibliography of each section by researching extant texts (and using digital surrogates of lost texts), as well as looking at the the authors, publishers, background information, and influence of the works themselves on the country and legal education. I will be publishing the segments over the coming weeks, giving readers of the JLPP blog some idea of the nature of these books, both as texts and as physical objects, and their potential purpose within the St. Ignatius Collection. What is the future of CatholicDH? The following comments were offered by Kyle Roberts, Director of the Jesuit Libraries Provenance Project, and faculty member at Loyola University Chicago on the Presidential Roundtable, “The Future of Catholic History: What Do Graduate Students Want to Know?” at the American Catholic Historical Association Annual Meeting on Saturday, January 7th, at 10:30 am in Denver. I’ve been asked to speak today for a few minutes about the future of Catholic Digital Humanities (#CatholicDH), a topic that I’ve had the chance to watch develop over the last few years from my position as a digital humanist and historian of religion at Loyola University Chicago. As the Director of Loyola’s Center for Textual Studies and Digital Humanities (CTSDH) for the past six months, I’ve become even more acutely aware of the opportunities – and challenges – that come with doing CatholicDH. What do I mean by “Catholic Digital Humanities”? At the CTSDH we tend to think of the digital humanities in terms of the way popularized by Kathleen Fitzpatrick: that the digital humanities represent the application of computational methods to longstanding questions of humanistic interest, as well as the application of humanistic approaches to thinking about how the digital is changing society. Put simply: digital approaches/methodologies for understanding the humanities / humanistic approaches to understanding the digital age. Fifty years later, the digital humanities have proliferated into many different approaches. Under the broad DH umbrella, we find digital archives, databases, digitization, fabrication (3-D printing), knowledge sites, electronic literature, gaming, mapping and GIS, mobile applications and augmented reality, network analysis, scholarly communication, social media, textual analysis, text encoding, and more. (There is a good new textbook by Crompton, Lane, and Siemens URL) if you need an introduction to many of these approaches.) This diversity reflects the reality that the digital humanities isn’t so much a field or a discipline but a set of methodologies that can be used by practitioners in a range of different fields and disciplines. DH nicely lends itself to multidisciplinary work. What are scholars of Catholicism doing in the digital humanities? Not surprisingly, their work is broad. The greatest amount of CatholicDH work has taken place in the archives in Catholic colleges, universities, dioceses, religious orders, and institutions. There was a great panel at ACHA on Friday afternoon, January 6, entitled “Digitization of Archives and Its Impact on Scholarly Research” which nicely revealed not only the extent of this work, but also many of the issues facing different types of Catholic organizations in digitizing their materials. A list of different sites prepared by Fernanda Perrone of Rutgers for that panel is at the end of this post. The Jesuit Relations: A Digital Edition (no URL yet) – an encoded scholarly edition of the 40 French language volumes. What is important with this second list is that it encourages us to think about Catholics in comparative historical perspective. As we know, few Catholics in North America had the privilege of living in isolation from folks of other faiths – Native American, Protestant, folk. Studying them in isolation misses the reality of their experience. Some have made the argument that scholars of religious history in general have lagged behind their colleagues in embracing the digital humanities (Reed, 2016). I don’t think this is an unfair assessment. I’d push it further and argue that within this group, scholars of Catholicism have lagged behind scholars of other religious groups. Looking at the extensive list of DH sites in religion in Chris Cantwell and Hussain Rashid’s 2015 report to the Social Science Research Council reveals that only 10 out of 160 (6%) are explicitly on Catholic topics. This is surprising given that 30/160 are on Jewish topics and 25/160 are on topics related to Islam. Why is this? Those of us interested in #CatholicDH need to reflect on why it is that the work in our field has taken the shape it has. Is it a reflection of interest? expertise? infrastructure? resources? (or the lack thereof?) I don’t think the current lack of more interpretive projects in Catholic DH is necessarily a bad thing. It gives scholars interested in taking on DH projects the opportunity to learn valuable lessons from other types of projects that have come before. What might #CatholicDH potentially have to learn from #JewishDH or #MuslimDH? Furthermore, the applications and platforms for doing this kind of work are much more powerful and generally easier to use. Our students are becoming increasingly valuable collaborative partners in this work, themselves the products of a generation of makers and social media users. So, should graduate students be involving themselves in the digital humanities? Yes. There are many ways to be involved. If you have the chance, take a class on DH. Most people I know in DH taught themselves. We didn’t have the luxury of classes on the topic. More graduate students now do. Take one. Learn the basic principles. Play around with different applications. You don’t realize it now, but you have more time in graduate school than you will ever again to play around. Enjoy it. Resign yourself to the fact that you will not be able to learn every DH application. Pick one or a few that are most interesting to you and relevant to your scholarship. Your curiosity will make you want to know about lots of different approaches, but you’ll eventually settle into one or a few to specialize in. If you have a chance to participate in someone else’s project, do. We’re all collaborators now. Write a blog post, transcribe some documents, help build a database, try to break a beta version. DHers tend to always be looking for partners. I know I am. This is a great way to build skills, but also to become better familiar with the emerging standards for doing DH work. Incorporate digital skills into your teaching. Start now. Your undergraduate students want these skills and you’ll be doing yourself a favor on the job market to be able to talk about how you can teach with DH. Remember that while online teaching is valuable, it isn’t the same as digital humanities (although many people who know nothing about DH conflate the two). This project proposes to create a digital humanities consortium of faculty, library, and staff at small comprehensive universities and colleges in the Association of Jesuit Colleges and Universities (AJCU). The project has two primary components: (1) a portal (a resource-sharing website) to advance digital humanities collaborations across our campuses; (2) a three-day workshop, bringing together AJCU stakeholders to jointly produce a vision statement and goals for the consortium, and a template for strategic planning on individual campuses. The consortium will foster a collaborative network of colleagues interested in exploring ways to promote and make visible digital humanities on and among campuses, and to spark innovation. This is exactly what I hope the future of Catholic Digital Humanities will be: faculty, archivists, and students coming together to share their expertise and resources, to work collaboratively on exciting new projects, and to increase access to primary source material about Catholic History and scholarship about it. Cantwell, Christopher, and Hussain Rashid. “Religion, Media, and the Digital Turn.” Social Science Research Council, 2015. Reed, Ashley. “Digital Humanities and the Study and Teaching of North American Religions.” Religion Compass 10, no. 12 (December 1, 2016): 307–16. Roberts, Kyle. “Digital Future of Jesuit Studies.” Catholic Library World 85, no. 4 (June 2015). Pasquier, Michael. “American Religion and Digital Humanities.” Religion in American History, (2010). Crompton, Constance, Richard J Lane, and Raymond George Siemens. Doing Digital Humanities: Practice, Training, Research, 2016. Join us at ACHA in Denver this Weekend! The Jesuit Libraries Provenance Project is on the road this weekend in Denver at the annual meeting of the American Catholic Historical Association. The pull program of the conference can be found here. Scholars have long focused on Protestants, especially in the nineteenth-century American Midwest, as the people of the printed word, from their founding of Bible and tract societies to the catalyzing power of Beecher’s A Plea for the West (1835). Catholics, however, equally availed themselves of print. This panel explores not only the crucial importance of print to growing American Catholic communities but also some of the complications that the larger marketplace of print created for them. The distribution of Catholic books through gift and sale reinforced the scattered members of Catholics, both clerical and lay. The specific texts distributed complicate any simple understanding of political/cultural/social identity in this period. They remind us of the transnational, hybrid identities of Atlantic World Catholics, balancing allegiances to the state, homeland, and the global Catholic Church. This panel emerges, in part, from the work of the Jesuit Libraries Provenance Project and seeks to reframe our understanding of religious community building through the mobility of texts. It does so by looking at such topics at the spread of ultramontane texts, the transnational distribution of mass-produced Catholic books and devotional images, and heterodox and obscene literature in a Jesuit college library. Between 1846 and 1878, Pius IX reigned as the longest serving elected pope in the history of the Catholic Church. A defining element of his papacy was his embrace of ultramontanism, the ideology that the global church should be centered in Rome with the pope commanding both infallibility and spiritual supremacy. Much has been written about the effects of ultramontanism on nineteenth-century European Catholics, but comparatively less work has been done to assess the impact the intellectual and spiritual principles of Pius IX may have had on American Catholics, particularly on their print culture and parochial education. My paper will explore emerging transnational connections in nineteenth-century American Catholic publishing when printers across the United States reacted to more reactionary religious ideals crossing the Atlantic from Rome. I will, furthermore, determine how writings inspired by Pius IX may have influenced Catholic education by using a single Midwestern institution, St. Ignatius College (precursor of Loyola University Chicago), as a case study. In approximately 1878, St. Ignatius College’s librarian compiled a catalogue of all the books on the library’s shelves, over 2,500 of which were published during Pius IX’s papacy. Even though only a fraction of those books survive, utilizing the surviving catalogue and digital resources developed by the Jesuits Libraries Provenance Project will help determine what texts originated from American Catholic publishers and how many of them fell in line with or deviated from ultramontane thought. Over the course of the nineteenth century, a multitude of Catholic publishing houses emerged in Europe. The role of these companies in the history of modern Catholicism is widely forgotten. This is rather astonishing, since from the 1830s onwards, Catholic publishers participated in the process of “Catholic mobilization” in many ways. Some of these publishing companies even became economically successful multinational enterprises with branches not only in several European countries, but also in North and South America. Especially in the United States, they served a growing market for religious wares such as prayer books, popular magazines, and devotional statues and pictures. Based on the example of the Swiss publishing house of the Benziger Brothers, my paper examines the expansion of the Catholic publishing sector from Europe to the United States during the nineteenth century. The Benziger Company had its roots in Einsiedeln, a village and popular pilgrimage site situated in a pre-alpine region of central Switzerland. At the height of its production in the 1880s, Benziger produced more than one million prayer books and several million devotional pictures per year in its factories in Einsiedeln. A considerable percentage of these wares were exported to the US. The Benziger Brothers made their first commercial contacts with the American market in the 1830s. The first branch in New York, however, was not established before 1853. Other branches in Cincinnati (1860), St. Louis (1875), Chicago (1886) and San Francisco (1929) followed it. This paper asks: along which networks did this remarkable expansion over the Atlantic take place? Which strategies did the publishers pursue in order to adjust their products to the needs of Catholic American society? Based on the extensive historical sources in the Benziger Brothers’ corporate archive, I will begin to answer these important questions. Our topic explores the restricted section of late nineteenth-century library history: the literature and theological works of papal-proclaimed obscenity and heresy, and how those works were treated inside the library of the Jesuit-run St. Ignatius College in Chicago. Looking at first the broader historical context of papal censorship in the nineteenth century, our research cross-examines the works of alleged mind-poisoning heresy and vulgarity from their the point of the famous “Index” of banned literature, to the ways in which the banned titles were actually treated within the library. Based on the extreme reactions toward any literature of questionable descent, our work tracks a series of titles and the questions their inclusion—or various circulating peculiarities—present in the context of a Catholic-run, American institution. We question aspects of possible Jesuit resistance toward censorship, the library and university history of the era, the functions of papal encyclical distribution, and the many mysteries that come with the archival research and textual analysis. 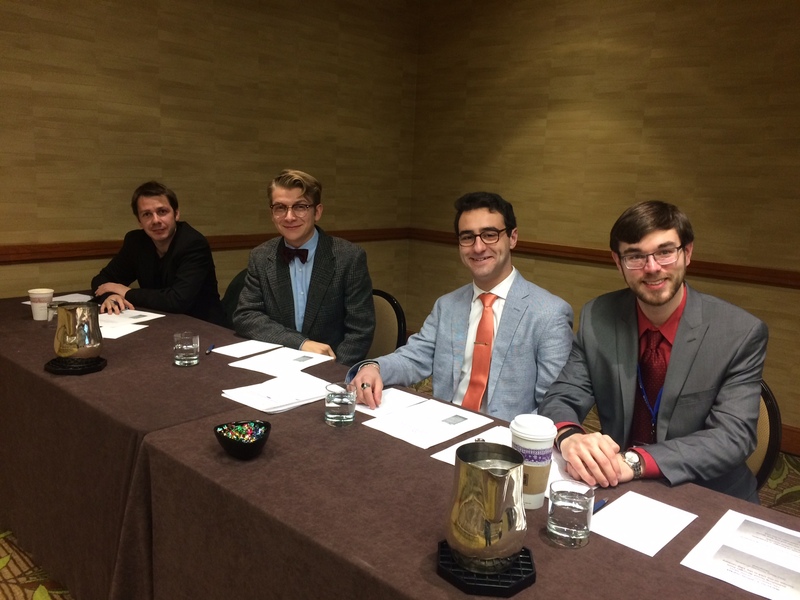 Presidential Roundtable: The Future of Catholic History: What do Graduate Students Want to Know? Saturday, 10:30-12 pm, Sheraton Downtown, Room: Governor’s Square 16. Catholicism and Americanism in the 19th Century: New Perspectives on an Old Debate. Saturday, 3:30 – 5 pm, Sheraton Downtown, Room: Governor’s Square 16. From left to right: Heinz Nauer (Lucerne), Gustav Roman (Loyola), Roman Krasnitsky (Loyola), and Michael Albani (Michigan State University). 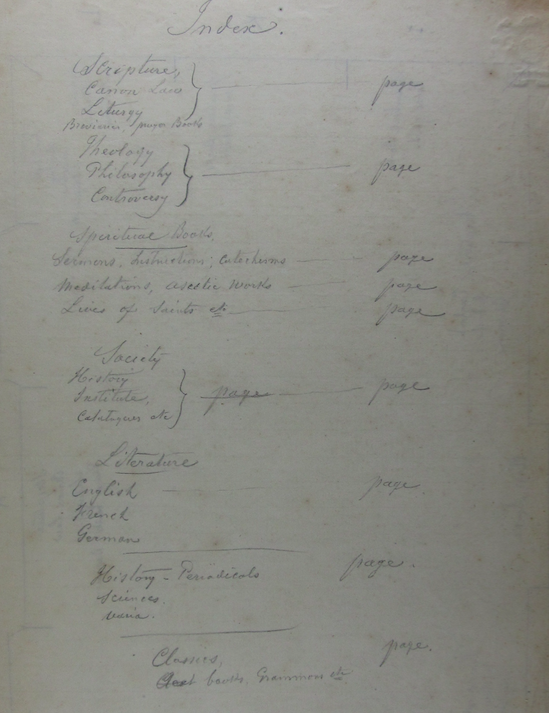 This post reflects on the JLPP team’s work on the 1840s book trade ledger from the Missouri Province this semester. 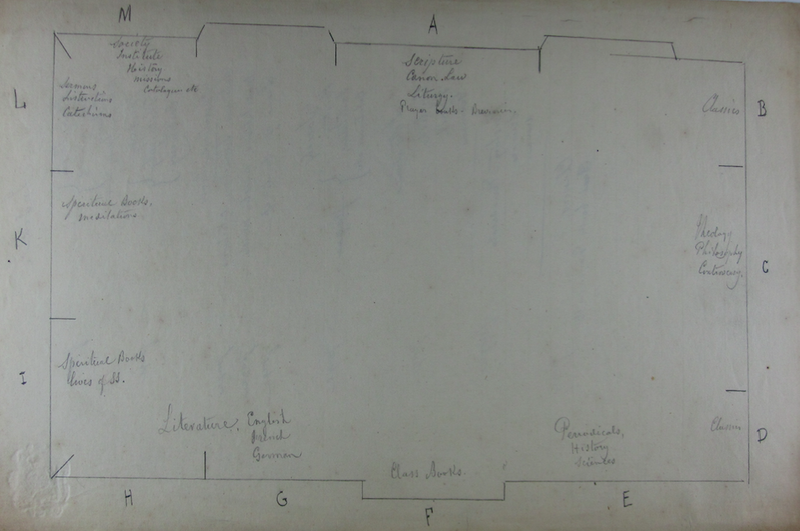 It pulls liberally from intern Bianca Barcenas’s reflections on the process in her internship blog Mapping Catholics with the Jesuit Libraries Provenance Project. 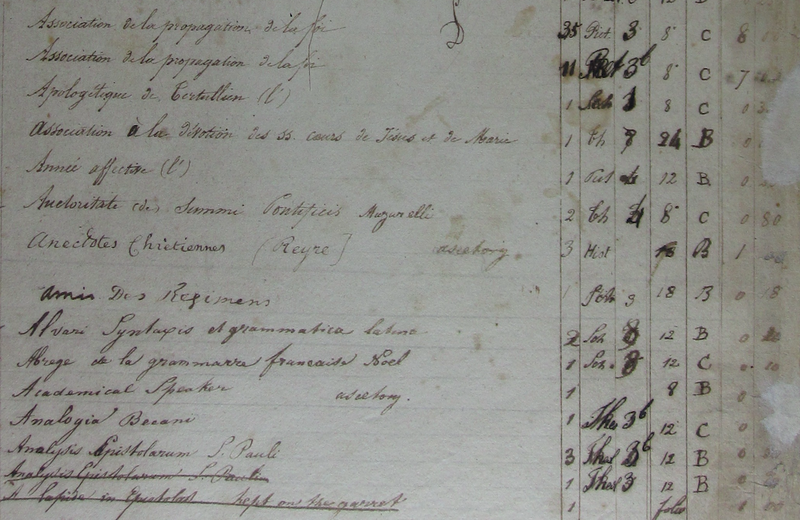 This past fall semester, three members of the JLPP team – junior Bianca Barcenas, Master’s student Dan Snow, and Prof. Kyle Roberts – turned their attention to an in-depth study of the purchases in the book trade ledger maintained by the Jesuits in St. Louis between 1842 and 1849. 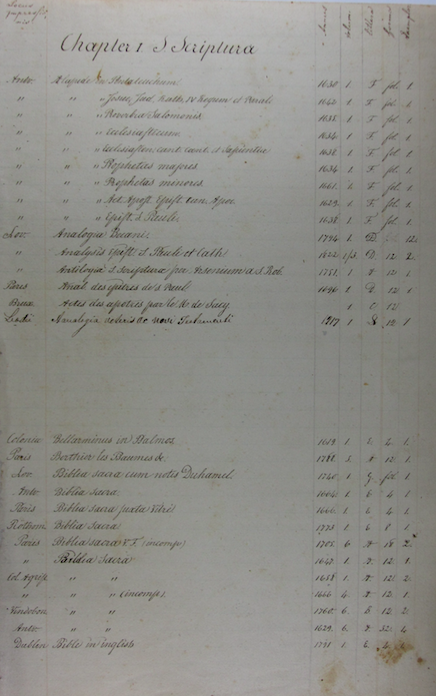 The original ledger is in the collections of the archives of St. Louis University, but the JLPP team was able to work with a high-quality scan of the rich document. 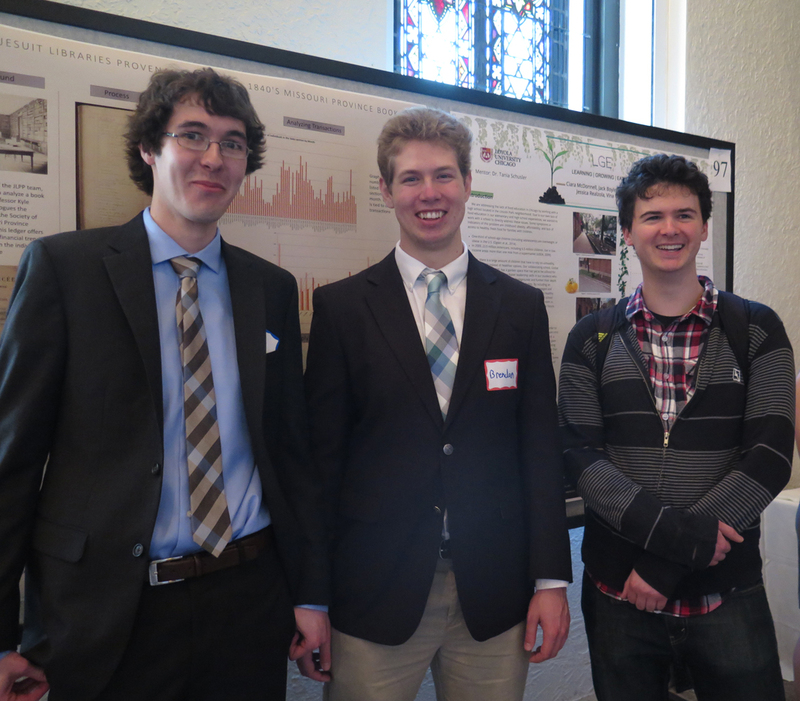 Dan Snow and Brendan Courtois (and fellow Ramonat Scholar Andrew Kelly) in front of the poster on their work analyzing the book trade ledger. Both Dan and Bianca had worked on the JLPP before. Dan researched some of the more interesting vendors recorded in the ledger’s “Bill Book” section last academic year and worked with Brendan Courtois on a big picture analysis of the ledger as a financial document. 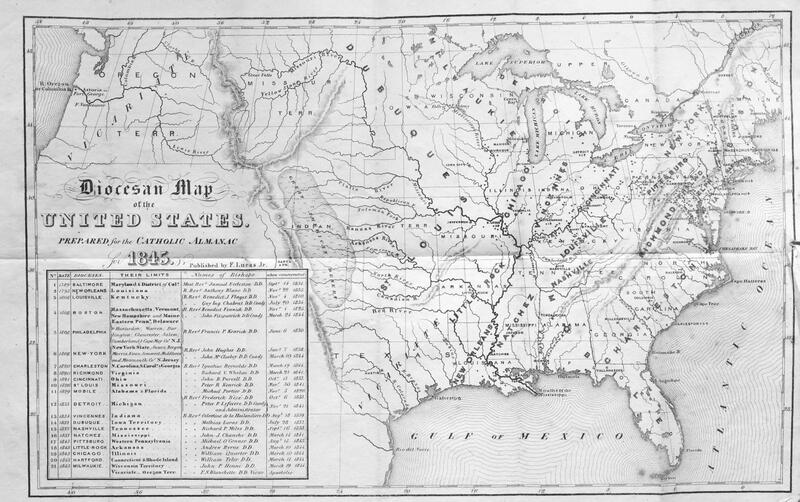 Bianca spent the summer detecting the contours of Mississippi and Missouri Valley Catholicism over time through a comparative study of statistical data in the 1841 and 1851 issues of the Metropolitan Catholic Almanac (MCA). 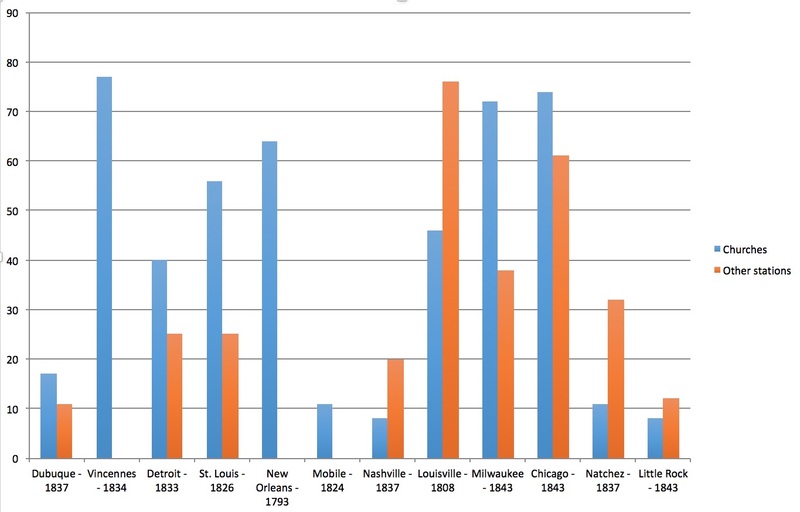 As her post from August revealed, the center of Midwestern Catholicism began to shift over the 1840s from St. Louis to Chicago and Milwaukee, as the number of parishes rapidly expanded and three new dioceses came into being. Bianca’s summer research set the stage for a formal internship in the fall semester while Dan contributed the free time he had between graduate seminars. Bianca’s Excel spreadsheet of purchasers. As her spreadsheet eventually grew to 380 transactions, Bianca found that her summertime work on the 1841 MCA offered a handy resource for making sense of nineteenth-century handwriting. Even as this early stage, names familiar from the MCA five years earlier appeared. Common names, however, made it difficult to discern whether the listed was Fr. Martins of St. Louis, Vincennes, or New Orleans. With a preliminary spreadsheet of transactions in hand, the third, fourth, and fifth weeks of the semester were spent determining how many unique purchasers were represented. For example, 124 different clergy and laity made Bianca’s 380 transactions. Variant spellings and abbreviations of names added another layer of complexity. Was Sister Olympia the same as Sister Olimpia? Was Mr. Coppes also Mr. Copes? A very helpful source available online! Identifying clergy was made easier by the rich listings in the MCA and, for Jesuits, the Archivum Romanum Societatis Iesu, both available digitally. (There are some gaps in the online holdings of the MCA, but Loyola’s Special Collections has a complete run for the decade.) The laity, however, proved a greater challenge. Most were difficult to identify with any degree of certainty. By the end of this phase of the project, team members decided to swap their spreadsheets to see if they could identify people that the others had missed. Each also selected a certain segment of consumers across the period – Bianca looking at institutions and women religious, Dan at parish priests, and Prof. Roberts at the laity – to analyze. While the rest of the team played catch-up cleaning their data and analyzing their purchasers, Bianca began to explore what institutions and women religious were purchasing across this period. What quickly became clear is that more than just books were being sold. Medals, beads, pictures, and crucifixes turned out to be popular sellers, a reminder of the importance of material culture to Catholicism. Curious about some of the titles that she repeatedly came across, Bianca looked at the history of three works in particular: Historical Sketches of O’Connell and his Friends, about the great nineteenth-century Irish proponent of Catholic emancipation; An Exposition of the Doctrine of the Catholic Church in Matters of Controversy, by the popular seventeenth-century French orator and polemicist Jacques-Benigne Bossuet; and The Poor Man’s Catechism by John Mannock. 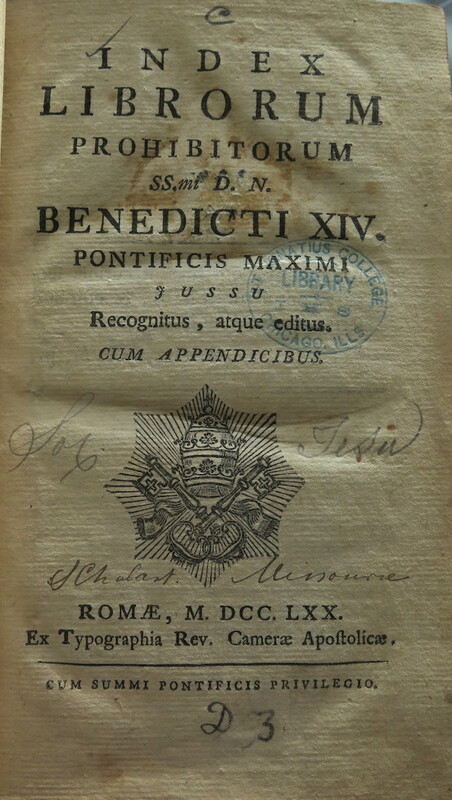 One of Bishop Peter Richard Kenrick’s many transactions with the Jesuit booksellers. By the mid-point of the semester, the team was ready to start aggregating and visualizing their transcribed and cleaned-up data. A new set of spreadsheets was created listing the names of unique purchasers, their locations at different points in time, and the frequency of their purchases. Most purchasers are only listed in one or two transactions a year. But a handful were very active patrons. Bishop Peter Richard Kenrick (1806-1896), for example, had 34 different transactions in May 1842-April 1843 and another 19 in 1846. Using the functionality of Google Fusion Tables, team members were able to create charts and maps to begin to identify patterns. One seemed to suggest a shift from clergy serving large swaths of scattered rural Catholics across a broad circuit at the start of the decade to their settlement in single parishes by the end. Bianca became particularly interested in thinking about movement and change over the first half of this period. 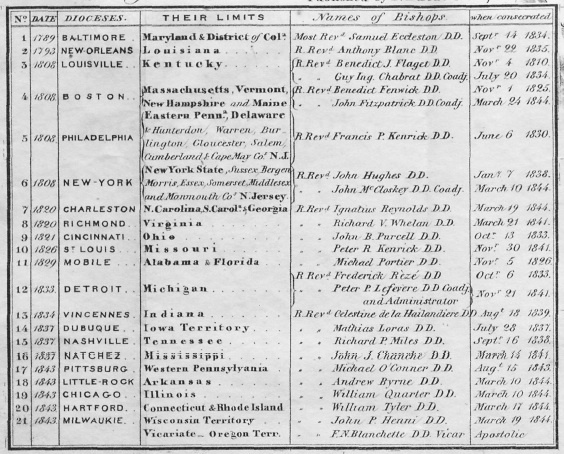 After isolating a list of unique purchasers from 1846 whose location could be ascertained in 1841, she mapped both to see their geographic spread. 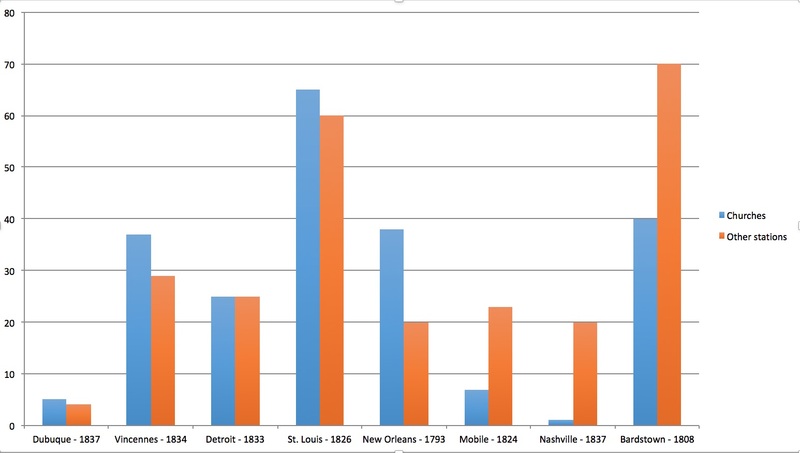 Even with this limited dataset, her maps reveal the broad expanse of the trade, centered in St. Louis, but stretching east to Kentucky, west to Kansas, north to Chicago and south to New Orleans. Throughout, the team sought to identify multiple variables about the unique purchasers. This included not only whether they were clergy or laity and their locations at the time of their purchase. The team also researched the order (if any) to which the clergy and women religious belonged. With the exception of the occasional (but inconsistent) “S.J.” after a Jesuit’s listing in the ledger, this information was very rarely recorded. But the Metropolitan Catholic Almanac often does reveal this, so Bianca went to work gathering this information. By the end of the semester, all of the team members had a good handle on their purchasers and could begin thinking about the books they bought. Bianca made the greatest progress in the latter inquiry. She resumed the work she had been doing at mid-semester. She used the history of one person’s purchases to craft a preliminary narrative about that consumer in 1846. () Then, in her final post, she undertook an aggregate analysis of sales over the first four months of 1846. Two things jump out from her work. First, the broad range of works being sold. She identified over 348 unique titles, a number that astounded the entire team. Second, she discovered that the best sellers were, less surprisingly, devotional works like Gother’s Sincere Christian’s Guide (22 purchases), The Key of Heaven (23), and the Ursuline Manual (23), but also, more surprising, beads (31) and pictures (39). Charting their purchase over time suggested some seasonal patterns to boot. Detecting seasonal pattens in the bestsellers of early 1846. In the spring 2017 semester, Bianca is off to study at Loyola’s John Felice Rome Center and is passing the baton to Dan, who will expand his study of the sales of particular books and what their significance might be to Catholics in the antebellum Midwest in a directed study. Stay tuned for more discoveries! Visit Bianca’s blog to learn more about her other passion: the theater! This summer intern María Palacio, a candidate in Loyola’s Master’s in Digital Humanities Program has been studying the earliest surviving library catalog from the Jesuit Seminary in Florissant, Missouri. This catalog has recently been conserved and made accessible to researchers. Here Maria shares some important insights gained from transcribing the catalog. 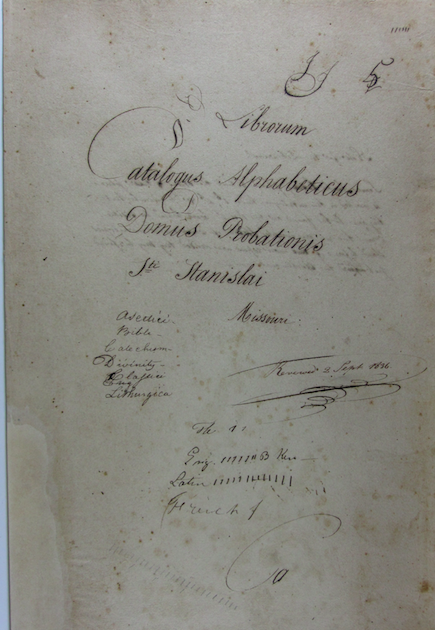 Last year, thanks to a grant from Loyola’s Hank Center for the Catholic Intellectual Heritage, the fragile Catalogus Librorum Alphabeticus Domus Probationis St. Stanislai (Alphabetical Catalog of the Library at the St. Stanislaus House of Studies), was conserved and made accessible to researchers. This 65-page manuscript, begun in 1836, contains the catalog, or more precisely a series of catalogs, for the library of the Jesuit Seminary at Florissant, Missouri. When it was first established in 1823, St. Stanislaus was populated by seven Belgian novices, but it rapidly grew into one of the main centers of the Society of Jesus in the Midwestern United States over the 19th century. By 1870, the Missouri Province Jesuits, who had their origins in the once small Florissant Seminary, founded St. Ignatius College in Chicago. By 1878, St. Ignatius College’s library held approximately 5100 titles, around 6 times more titles than Florissant’s library forty years earlier. Although the Catalogus Librorum is considerably smaller than the original catalog of St. Ignatius, it is hoped that, by studying this earlier catalog, and looking for overlaps in both collections, we can better understand the history of Loyola University’s original library. However, before we could start comparing both collections, I needed to transcribe the Florissant catalog. Given the fact that the catalog appears to have been written by more than one person, and that some of the pages are written with different ink types or even faded by humidity, this document cannot be read and transcribed by only looking at it once. Therefore, I decided to divide the transcribing process into three stages. In the first stage, which I recently finished, I tried to read and transcribe as much as I could without stopping to think a lot about the fragments that I could not read or that confused me. Instead, I marked all those cases to revisit in a second stage when I have a greater understanding of the documents and more familiarity with the different handwriting styles. Finally, in the third stage, in which I expect to have an almost definitive transcription, I will encode the text in an XML format. This encoding will allow for the better digital preservation of the transcription, and to markup different characteristics of the text: the deletions, the changes in handwriting, the type of ink, the languages, etc. While it is too soon to compare this catalog with Loyola’s first catalog, I have been able to study this document itself, analyzing its fragments and particularities, and ask a series of questions about book circulation and organization in this Jesuit library in Missouri. By transcribing the catalog I realized that this document is actually composed of several fragments: a “Note for the librarian”, a small Index, a map of the library, a rudimentary borrowing ledger, the Alphabetical Catalog, and a second catalog (the Subject Catalog) created in a different time and by a different person. The “Note for the Librarian” is a short text to help the librarian understand some confusing aspects of the Alphabetical Catalog. We can establish that the “Note” is related to the Alphabetical catalog for two main reasons. First, both are written with the same handwriting and ink type, which could mean that the note was written by the same person. Second, the Alphabetical Catalog employs 7 categories to catalog the books, including Provincia, which classifies the titles by topic, and Locus which designates where the titles must be located in the library. These two categories only exist in the Alphabetical Catalog and are indirectly mentioned in the “Note.” For instance, the “Note” explains how the Locus category works: “Some books being placed behind the others, their place is marked in this catalog thus: 1b, 2b etc to indicate that they are to be found on the 1[s]t or 2[n]d board behind the visible…” By reading this note we can establish that the number in Locus determines the board in which a book was placed. Sometimes, probably for space reasons, a book had to be placed behind other books and it was not visible to the librarian. To solve this problem, the books placed behind are marked with a “b” next to their Locus number in the Alphabetical Catalog. That way, the librarian could find a book in a respective board even if it was not visible. Moreover, in the present, this piece of information can help us to partially understand Florissant’s library organization and limitations. For instance, in the Alphabetical Catalog there is a total of 46 items with this kind of Locus: 23 of books belonging to the Theology Provincia, 19 to the Scholastica, 2 to the History and 2 to Piety. More interestingly, the Provincia and Locus of almost half of these items was modified over the course of time, resulting in the need of the “b” designation to be able to fit them in a different board. This fact could lead to the conclusion that organization of the library was parallel to the creation of the Alphabetical Catalog, and it gave enough space for most of the books in each Locus and Provincia to fit well in their designated boards. However, when the classification of some items changed some space problems appeared resulting in the need to use the “b” designation more often. Alphabetical Catalog illustrating items marked with a “b” next to their Locus number. I expected that the Index and the map would help me to better picture this library. However, apart from the fact that they appear to be written with the same handwriting, there is not a clear relationship between the Alphabetical Catalog and these segments of the document. We can be certain that the Index and the map are directly related because the categories listed in the first are then explicitly mentioned in the second. Yet, most of the categories mentioned in the Index and the map are not mentioned in the Alphabetical Catalog. While in the map, books appear to be organized in sections named as letters from A to M, in the Alphabetical Catalog books appear to be organized in the library by its Locus number. All these facts make it hard to draw a relationship between the first segments of the document, and the Alphabetical Catalog. Perhaps, since they are both written in pencil, the map and the Index belonged to an earlier or later cataloguing project. Map of the St. Stanislaus Library. Once I transcribed the Alphabetical Catalog, I realized that it was an intriguing document. The fact that is written in cursive and organized into tables, points out it was conceived to be an official catalog, and not just a temporary list of books and where to find them. There is an effort of classifying the books alphabetically by author (or barring that, title) and by topic (using the Provincia category), as well as an attempt to keep record of the location, format, physical condition, and price of the books held by the library. However, in this document we can also find traces of usage like annotations, marks, and deletions, made with different ink types and sometimes with a different handwriting. For instance, the category Provincia, in which books and documents are classified by its topic (theology, piety, history, etc. ), appears to be a continuous source of hesitation, especially when dealing with titles directly related with the Society of Jesus. Apparently, when the catalog was created all of the books related with the Society of Jesus, or written by one of its members, were listed under the Provincia IHS, the christogram used as the symbol for the Society of Jesus. However, at some point, someone, maybe a different librarian, decided to eliminate IHS as a classificatory topic and reorganize all the titles that appeared under that Provincia under other classifications. There were 47 entries of the catalog classified as IHS and, since the classification in Provincia affects the one in Locus, its elimination must have had implied a big change on the library’s organization. Changes in Provincia in the Alphabetical Catalog. Another trace of usage, that shows how this collection and the library’s organization changed over the course of time are the series of deletions and annotations that appear on the catalog. Often items are crossed out. This implies that those items stopped being part of the collection of the library. Since there is not a date accompanying the deletion, we cannot know when items stopped being part of the collection. However, sometimes, the crossed out items have a note next to them specifying that they were given away and to whom. This fact reveals to us that this collection circulated outside the Seminary. Is it possible then that some of the books of the collection ended up being part of Loyola’s first library? At this point, we cannot answer many of these questions. However, we can be certain that the library and its catalog were not static entities, and that they were constantly modified by human interactions. Around ten percent of the Alphabetical Catalog is currently crossed out. That made me think that, at some point, there appeared the need to rewrite and actualize the catalog. That could answer why the segment of the Alphabetical Catalog is followed by another catalog clearly written by another person and in a different time. The second catalog, or Subject Catalog, is considerably shorter and has a very different cataloguing approach, but it is very likely that it addressed the same collection than the Alphabetical Catalog, because there is an overlap of more than ninety percent of the titles between the catalogs. The main difference between the catalogs is that the Subject Catalog is not organized alphabetically, but in chapters by subject: the Sacred Scriptures (Bibles and the books or texts that analyze them) and Ecclesiastical history (texts about the expansion of Christianity, Catholic history, Jesuit history, etc). This catalog seems to leave out all the titles that are not directly related with the Christian faith, and that were part of the collection of the Library in Florissant like dictionaries, grammar books, books about history and medicine, literature classics, etc. One possible explanation for the missing items in this catalogue is that it was never completed. However, this hypothesis seems unlikely if we take into account that the Subject Catalog has numerous traces of usage like deletions and posterior annotations. A more plausible explanation could be that some pages of this Subject Catalog are lost. We already know that the manuscript we have our hands is not complete because the section of the titles starting with the letter “C” is missing from the Alphabetical Catalog. Therefore it is not unlikely that some pages from the Subject Catalog are missing too. Furthermore, the Index and the map of the library could actually be related to the Subject Catalog and support the idea that some pages of this catalog are lost. The Index is not divided in chapters, but it is clearly divided in sections that could represent chapters. The first section lists topics like Scripture, Canon, Philosophy and Controversy which are also the topics of the books listed in the first chapter of the Subject Catalog. Moreover, the second and third sections of the Index, which lists topics such as Sermons, and Lives of the Saints also correspond with the titles listed in Chapters 2 and 3 of the Subject Catalog. The Index has four more sections that list topics like Literature, Classics, and Languages, but, since the Subject Catalog we have ends in Chapter 3, we cannot confirm if there were parallels between the rest of the Index and the possible missing pages of the Subject Catalog. Since the Index seemed to be related to the Subject Catalog, and the map of the library is certainly related to the Index, I tried to find a relationship between the map and the Subject Catalog. However, apart from the fact that in both documents books seem to be organized in the library by letters, I could not find a clear relationship between them. While in the map books are organized in sections from A to M, in the Subject Catalog we can find books with Littteras like “O” and “S”, which are not included in the map. Moreover, in the map, letter sections are organized by topics (for instance, the books placed in the “G” section are related to English, French, and German languages), but this topics do not correspond with the topics of the books under the Littera “G” in the Subject Catalog , where we can find titles like Concordantia Bibliorum and Notitia ecclesiastica per Cabassutium. Therefore, we cannot establish a clear relationship between the Index and map and the Subject Catalog and we can not use the information in these pages to confirm the incompleteness of the Subject Catalog. Even if the Subject Catalog is incomplete, it can still be an useful complement to the study of the Florissant’s collection, because it gives information that the Alphabetical Catalog omits. Since it is already organized by topics, the Subject Catalog eliminates the Provincia category. It also replaces the Locus category for a category called Littera (which uses letters instead of numbers to determine the placement or a book within the library) and records the year of publication, place of origin, format, and number of volumes. This latter information is very useful from a History of the Book perspective, because it allows us to better understand the origin of the items. Moreover, the introduction of the year category allows us to determine the probable date of creation of the Subject Catalog. For instance, we can establish that it must have been written at least ten years after the Alphabetical Catalog, because it contains items from years after 1836. With the information on the catalog we can also estimate that it was created around the year 1846, because there are no books from any year after 1846. This fact could lead us to conclude that, after 10 years of usage, the Alphabetical Catalog was replaced by the Subject Catalog. But why? I already mentioned that around 10% of the Alphabetical Catalog is crossed out, and that in the Subject Catalog we can find titles that do not appear in the Alphabetical Catalog. However, are this changes enough to create a new catalog with a very different approach to the collection? Why did they did not create a new copy of the Alphabetical Catalog instead of a brand new type catalog that implied a whole reorganization of the collection? And, moreover, can we be certain that the Alphabetical Catalog was completely replaced by the Subject Catalog? Previously I mentioned there is a segment of the Catalogus Librorum composed by a series of informal lists of books lent from the library. This pages could be considered a rudimentary borrowing ledger. I say rudimentary because the 11 pages that contain lists of books lent from the library do not have the same organization system or contain the same kind of information: some of them just contain a segment of the title that was borrowed followed by a name, while others are more organized tables that also contain the date in which the title was lent. However, most of this pages appear to be written by the same person who wrote the Alphabetical Catalog, which is odd if we take into account that the date of February 1852 appears in one of them. Moreover, in that same list we can find books that do not appear in the pages we have of the Subject Catalog like a Latin Grammar and a book by Virgil. Could this list help us prove that some pages of the Subject Catalog are lost? 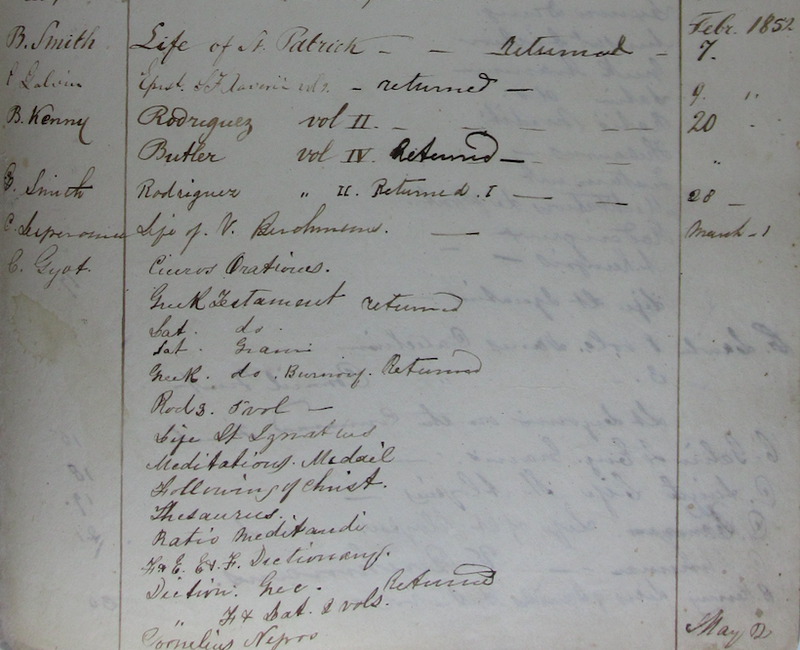 Or, could this mean that the Alphabetical Catalog, which appears to be written by the same person that the lists of the borrowing ledger, was still used by 1852? Was the author of the Alphabetical Catalog the librarian of the Florissant collection and, for that reason, his handwriting appears in documents from 1852 when the Alphabetical Catalog had been replaced? We can not answer any of these questions with total certainty, but at least we can be sure that the Catalogus Librorum Alphabeticus Domus Probationis St. Stanislai is an intriguing document that will not only allow us to compare the collections of the library in Florissant with Loyola’s first library, but also to study issues of cataloguing practices and book circulation in other Jesuit libraries. 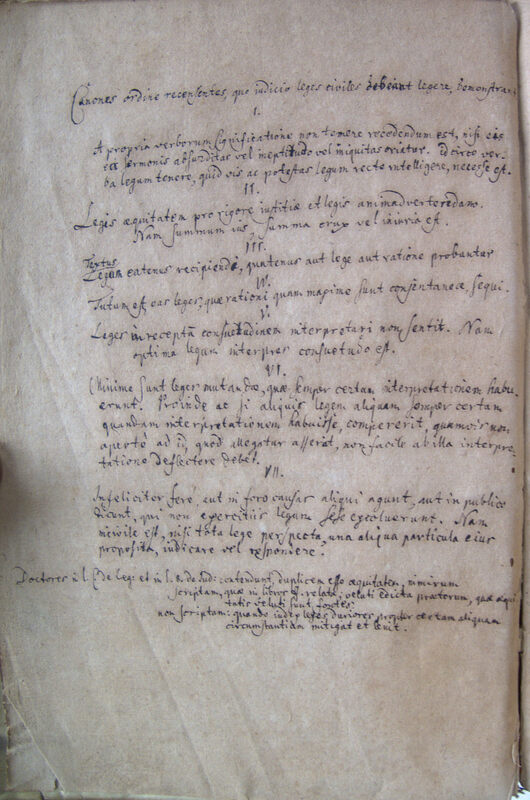 In the second installment of CCIH Fellow Gustav Roman and intern Roman Krasnitsky’s research into heretical books in the original library collection at St. Ignatius College, Roman looks at the presence of two copies of the Index Librorum Prohibitorum in the collection and their significance over time. The nineteenth century’s mammoth surge of Papal Encyclicals concerned with the devilish workings of conspiracy, sabotage, heresy, and the reactive necessity of censorship from the Catholic Church presents an interesting backdrop for the building of the St. Ignatius College library. In trying to understand the ideas that would be classified as heretical in a Jesuit college’s library, we discover no easy path in coming to a sound definition grounded in historical Catholic understandings of general literary and theological indecency. Where the Encyclicals give us an easy sense of context in theory, what was done with them in practice is less clear. We know by looking today that our excerpts of Papal authority on the matter of censorship are not proud moments for the church—it seems to be an era of deeply realized but unfocused Church hysteria. Our question is how these missives from the global church were received on a local level. The Encyclicals directed at the censorship of particular content in books are never wholly limited to that. They are often interested in such a variety of fears that it’s hard to see what nineteenth-century Jesuit faculty and students would make of them; not that a piece of rather hysteric intrigue directed at uncovering plots made by dastardly Prussian bishops wouldn’t have interest, but it may not be a directly preached social reality to anyone in an American Jesuit college in 1870 in the heart of a growing metropolitan landscape. This would be a question for the Bishop of area. Bishops were the real means of distribution for Encyclicals, based on varying levels of importance found in the place where they are stationed. Just as Bishops today empathize or underplay various statements from the Vatican, so, too, did Bishops have the authority to do so then. Unlike today, however, in 1870 clear alternative means of distribution for those who sought it out did not so easily exist. 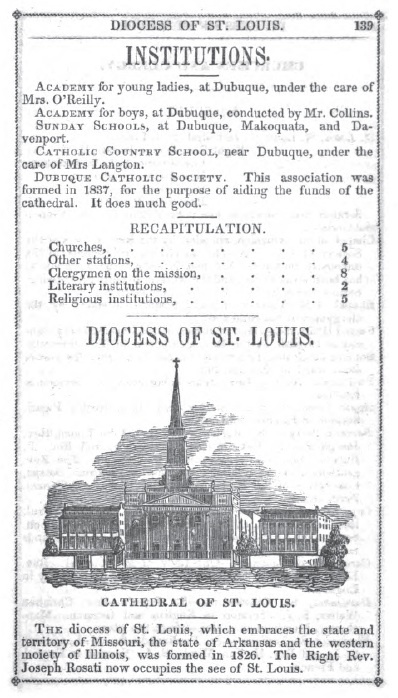 Cover of the 1870 edition of the Index Librorum Prohibitorum given by the Missouri Province to St. Ignatius College. Collection of Loyola University Libraries. The clearest framework and tangible point of reference in trying to understand a Catholic worldview of limited literary intake and the harsh didactic language of the harmful repercussions of these “books which openly oppose the teaching of Christ” would rest in the reception of the fittingly titled Index Librorum Prohibitorum (translating eloquently to the List of Prohibited Books). At least this would seem to be the case. The book gives us exactly the clear hard facts that the Encyclicals themselves were often blurry on. That is to say, it tells good Catholics what they should not read. A dry, seemingly never quite exhaustive—even if exhausting—Latin text of well over 350 pages of small-font print by 1870, the Index stated title upon title, from Immanuel Kant to Martin Luther to the ominous sounding independent titles like The Spirit of Popery. The Index had been in the works well since the ninth century, as early Christian tradition shows us, in unofficial productions of lists restricting various blasphemous or simply untrusted texts. Drafts were produced until the 1559 appearance of Pope Paul IV’s clear incarnation known as the Pauline Index. A slight refinement during the Council of Trent produced the more relaxed (in the inquisitional definition) and fittingly titled, Tridentine Index. It aimed to clear up any controversy produced by Paul’s draft. Twenty different editions appeared up until 1966 when the gigantic list ceased to be added to and was never again republished. Much scholarship has been done on the Index to show its evolution and the patterns in how it grew, as well as who added the most. Our question for the Index by the time of 1870, within its last century of existence, is just how relevant it was to the library and what it can tell us about the definition of heretical texts. Two editions of the Index Librorum Prohibitorum (1841 and 1870) resided on the shelves of the library of St. Ignatius College. We know from the surviving 1870 edition that it was gifted to the college by the Missouri Province, the Jesuits who founded St. Ignatius and, at the time, oversaw most of the schools and houses in the middle portion of the country. In the c.1878 catalog, the two editions of the Index were shelved with other “miscellaneous” titles like The Magician’s Own Book (1857). Image from Hathitrust. The surviving 1870 copy is clean and undamaged. No marginalia reveal the thoughts of Jesuit commentators or anyone else. There is no apparent evidence of it being checked out extensively or closely read by any possible librarians or censors. What exists in the library is a tightly bound and only slightly age-worn work in which the large list of titles stretches well across pages and pages of text. The work itself was not easily dealt with by anyone, or so it would seem. 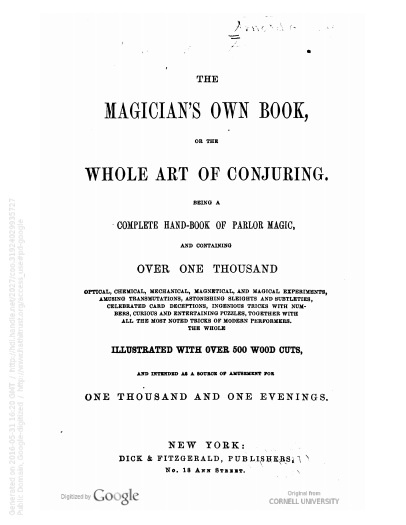 It was placed on a shelf of seeming misfit titles, sandwiched between books like Excelsior, or, Essays on Politeness, Education, and the Means of Attaining Success in Life (1873), The Elements of Tachygraphy (1874), and The Magician’s Own Book, or The Whole Art of Conjuring (1857). Not even considering the possible heretical fit that the final title could stir, the library appeared not only to be unsure of where to place the Index, but also seem not to have been phased by its very existence. Likely displayed on library shelves more as a reference tool, or a gesture of outward piety and obedience towards the Province, the Index gives a sense of infallible authority shelved amongst oddities and superstition. Not that 1870 gives us a golden age, if you will, for the Index. Papal shifts find this and the years leading up to it as quieter times in the Catholic discourse on censorship. Although a reason for this shelving of the book can just as easily be placed toward the internal reason of Jesuitical rebellion, another reason could just as easily be from the Vatican itself. The very language of censorship as a main focus had calmed down drastically by 1870, with the Papacy of Pius IX focused more on housekeeping than possible conspiracy. The harshest of his 16 Encyclicals to a modern reader is likely Levate, which deals with affliction in the Church and harshly condemns the secular, governmental college—something St. Ignatius escaped. Still unclear is how Bishops and Provincials interacted with and how a rising college navigated these patterns of Papal thought. In the face of professors’ orders, librarians’ meddling, and students’ desires, how might the Jesuits have possibly challenged the constructs of censorship to produce such a well-rounded library? These questions remain as we further explore these modes of textual interaction. The Index Librorum Prohibitorum gives us an exhaustive list of heretical candidates, but our question coming out of this is what the library considered to be heresy and obscenity in the face of this seeming dismissal—intentional or otherwise—of such an authoritative source.